Carlsberg has caved to complaints from the family of a famous Mandalay singer, who say the Danish brewer used the title of one of his hits as the name for Tuborg Beer in Myanmar. “In light of the claims of the relatives of the late Sayar Myoma Nyein and the general debate about the use of "တူးပို့" in the market of Tuborg Beer we will discontinue the use of this spelling,” the brewer said in a statement dated January 19. The firm chose the name, which is pronounced Tu Po, when it launched sales of locally-brewed Tuborg early last year. But the Myanmar term is also the name of a well-known song by famous composer Sayar Myoma Nyein, who died in 1955. The song is played regularly during mass street celebrations of the Thingyan water festival, an occasion when beer sales soar. U Shun Myaing, Sayar Myoma Nyein’s son, told The Myanmar Times that Carlsberg had met with him to request permission to use the term, but he refused. Carlsberg could not be reached for comment. “I denied [permission] but they used [it anyway],” he said yesterday. The firm had used a term with “beautiful” and “cultural” meaning as the name of a beer, U Shun Myaing said. The family told a news conference on January 15 that they had intended to take Carlsberg to court over its use of the word. They claimed that its use insulted the cultural festival of Thingyan. The Myanmar Times understands that the firm was confident such a suit would not have been successful under Myanmar law. Nevertheless the dispute – widely discussed on social media where the family received public expressions of support – illustrates how giant multi-nationals have to tread carefully in a country renowned for its religious and cultural sensitivities, regardless of the strength of trademark and copyright laws. U Shun Myaing told The Myanmar Times that the family would no longer pursue a lawsuit. The family accepted the change, but felt that Carlsberg should have addressed a response to them, rather than issuing a press release. The brewer is taking “immediate steps to implement the necessary modifications” and hopes to have these made by Thingyan, the press release said. 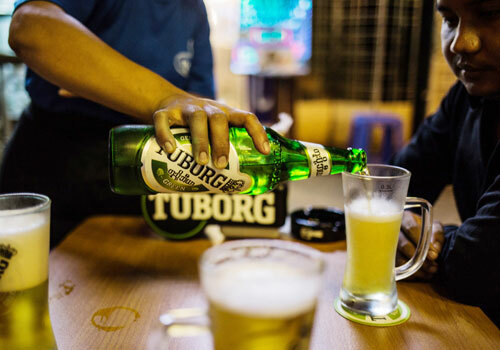 Carlsberg will use the original Danish brand name Tuborg to market the beer in Myanmar. “We respect Myanmar sentiment and we remain committed to fair and transparent business practices in the Myanmar market,” the company said.